Child abuse, teen pregnancy, substance abuse...these are some of the risk factors you face when you live in Gregg County, Texas. Now, I'm not bashing Gregg County. Please understand that Gregg County is just like most counties in the United States. Yes, they're ranked third-highest in the state for these risk factors, but they're doing something different. As you read this post, ask yourself: What about my county? What is being done to connect fathers to families? This post is an example of how one group is helping fathers learn the skills they need to be good husbands and dads. Let's put the spotlight where it belongs, on the great work in Gregg County with the Buckner Project and the Texas Department of Family and Protective Services. We often talk about the father absence crisis in America. Knowing the statistics is vital. But knowing the stories of real leaders leading groups of fathers in their community is equally important. These leaders, often volunteers, are working to make a difference in the lives of fathers and families right where they live. Ellen Goodacre, writing for the Longview News-Journal, talks about our 24/7 Dad® helping fathers become dads in Longview, Texas. She writes, William Birmingham says "irresponsibility, drugs, multiple relationships" and other issues led him to take part in a new Longview program that aims to teach participants how to become better fathers. Buckner Child and Family Services Project HOPES started its 12-week "24/7 Dad" classes in January. It's the first of its kind in Gregg County. In addition to face-to-face mentoring, the program covers topics such as family dynamics and problem solving using curriculum from the National Fatherhood Initiative (NFI), Buckner officials said in a statement. Birmingham, 38, of Longview and another participant, John Bandy, 44, also of Longview, were referred to the voluntary class through the House of Disciples Life Recovery Center. "Just wanting to be a better father is what brought me to this class, to be a father," Birmingham said. "I've been married four times. I just wasn't there, so tackling absence, broken promises." Birmingham said he has lost visitation privileges and cannot see his 13-year-old son and has not spoken to his 10-year-old daughter in months. "Fatherhood, parenting is not to be taken lightly," Birmingham said. "This is real. This is the most important job you'll ever have. It's more important than a career, and our future depends on it." Sean Goram-Welch, fatherhood educator with Buckner Child and Family Services Project HOPES, said most people "don't know exactly how to be a parent." "We have certain knowledge that we've picked up along the way, but no one's ever sat down with most of us and said 'Hey, this is what it looks like to be a father and here's how you do this,' " said Goram-Welch, who teaches the weekly class. "Too many times, (fathers) are just known as the check writers. We provide, and that's all we do, and so we don't really get to learn how to interact with our children." Buckner Project HOPES is an initiative with the Texas Department of Family and Protective Services to serve children and families in at-risk situations. In 2013, the department ranked Gregg County third-highest in the state for being at risk for family violence, teen pregnancy and early substance abuse. "Part of the reason we were granted the program is because Gregg County has a higher percentage of child abuse, one of the highest in the state," Goram-Welch said. "And one of the specific risk factors that put a child at risk for abuse is if they don't have a father who is active and engaged in their life." Bandy, a father of four, said he was working as a contract welder and struggling with a drinking problem when he enrolled in the House of Disciples program this past year. He began attending First Baptist Church of Longview after entering the program, where he met Goram-Welch. "I met Sean, and Sean told me about the parenting class, and I told him I was interested in it, and now I'm here, and I like it," Bandy said. "I think we get caught up in our worldly activities sometimes to where little things that mean a lot to kids, we forget them. I did. Simple things, (like) spending $10 and going to McDonald's. That's like going to Disneyland for them, and I'm realizing that little things mean a lot." Local parents should feel good about attending any of the parenting and family dynamic classes offered by Buckner Family Services, Goram-Welch said. "We all have holes in our game, if you will. There are certain things we're good at and certain things we're not, so this is to help shore up the areas where we may be lacking," he said. Buckner has been serving children and families in Northeast Texas since 1992. In 2014, the nonprofit agency served more than 9,150 residents through foster care and adoption programs, after-school programming and more, officials said. I hope that reading this post you come away with this idea: It only takes a few committed leaders to be intentional about reaching fathers. Will you help connect fathers to families in your county? Ready to start helping fathers today? 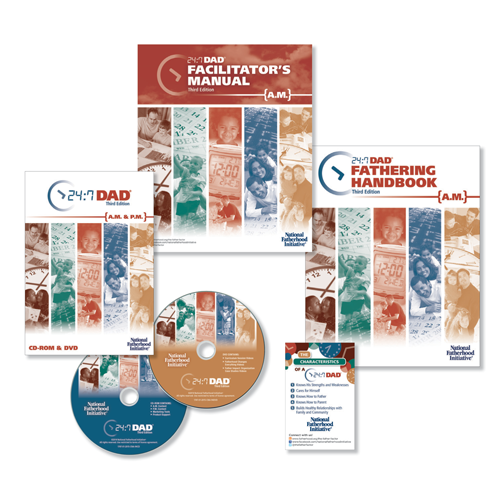 Our flagship fatherhood curriculum, 24/7 Dad®, is used by thousands of organizations and leaders across the country to help fathers be involved, responsible, and committed 24 hours a day, 7 days a week. Visit our 24/7 Dad® Program page to learn more. 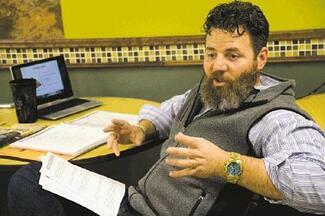 Read the full article and see more images of the fatherhood group at the original column in the Longview News-Journal.